In the mid‑17th century, the Rev. 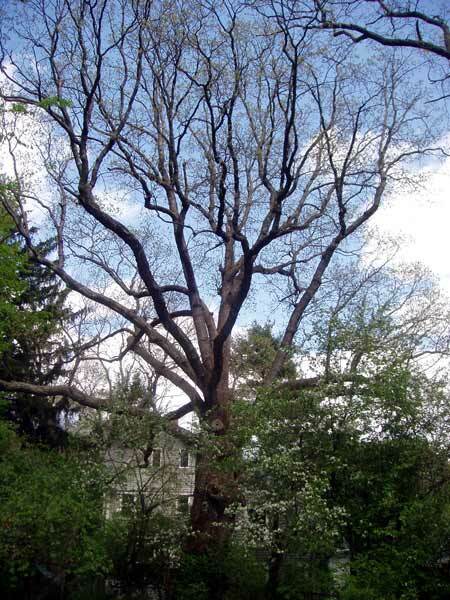 John Eliot preached to the Indians under a large oak tree still standing where the house lots of 49 and 61 Collins Road meet that of 18 Annawan Road. The color photo shows the tree is still here today although the story may not be entirely accurate. Scattered through the streets of Newton are a surprising number of houses which illustrate the architectural changes which have taken place in our community since the late 17th century. The first rectangular dwellings with central chimneys, two‑chimney colonials, the stately, well‑proportioned houses of the Federal period ‑‑ all may be found still standing and in reasonably good condition. Nearer 1855, the shut‑off date for this listing, came the beginnings of Victorian ornamentation with the Gothic or Italianate influence, a number of houses of the Greek revival style, and even a novelty with ten sides. The architectural heritage of an area is one of its cultural resources and is of considerable significance and interest to its people. 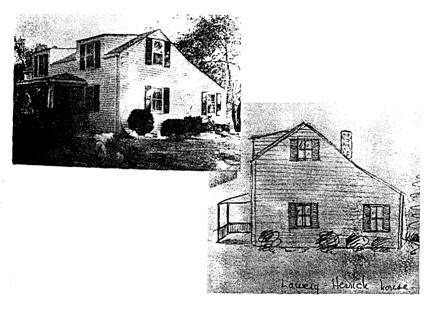 In order that the citizens of Newton may become more familiar with the older houses of this city and with the fascinating variety and individuality of home styles to be found here, this study was undertaken. It can be considered a worthy direction for the attention of the Jackson Homestead, Newton’s unique historical museum. Hopefully the listing will further a pride of ownership in houses of earlier periods and encourage both their preservation and restorations which are authentic and yet appropriate for modern living. Perhaps more people of Newton will come to realize that the ownership of an ‘told” house can be an asset to themselves and to the community. Often exceptionally well‑built, many an early house can be preserved to benefit generations yet to come. Perhaps you are wondering why 1855 was selected as the cut‑off date of this study. At the Jackson Homestead is a map of Newton with a dot for each house standing in that year. In most sections the name of the owner at the time is also included. (Incidentally we believe this map to be amazingly accurate.) The first step was to determine how many of those houses are still standing, and then we proceeded from there. There were visits to City hall and to the Registry of Deeds and countless telephone calls to present owners. 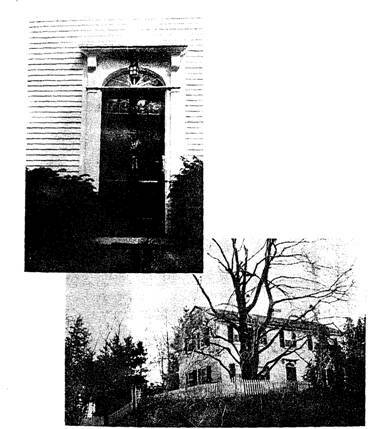 A previous publication, #2 of the Jackson Homestead series, was entitled “Some of the Older Houses in Newton.” For this, extensive and meticulous research was carried out by Mr. Fred C. Alexander, first chairman of the Board of Trustees of the Jackson Homestead. A great many of the facts which he uncovered have been incorporated into this later edition. Much further material has been added by a team of dedicated volunteers, alias the “Newton Detectives”, who spent endless hours in the process. There is no claim to complete accuracy in this listing. Records are sparse and facts most difficult to come by. Surely there are omissions. It is hoped that those who discover errors or who can share additional information will contact the Jackson Homestead. It is to be noted that the Jackson Homestead is the only house named which is open to the public. 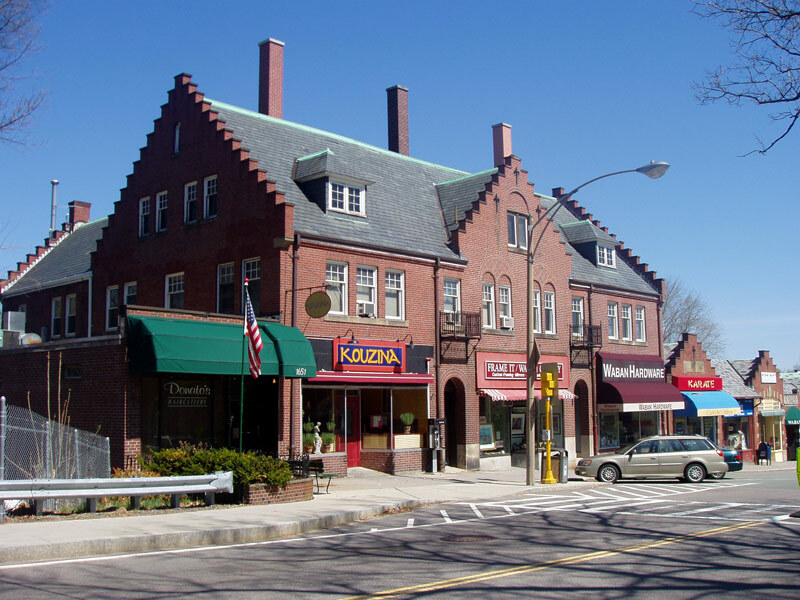 Waban Hall, situated at the corner of Woodward and Wyman Streets, and built in 1890 through the efforts of the Waban Improvement Association, has the distinction of being Waban’s first commercial block. The hall was designed to accommodate several shops on the street level and had a community hall on the upper story. 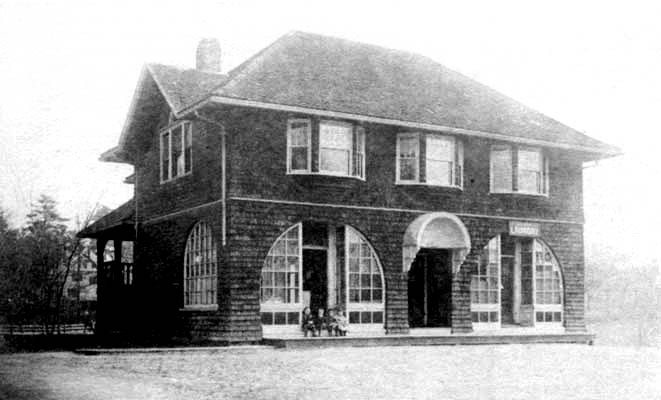 it was here the Waban Improvement Association held its meetings, local children attended public school, and where the Waban Christian Union held its first services. A laundry and Moulton’s General Store were first to rent shops. 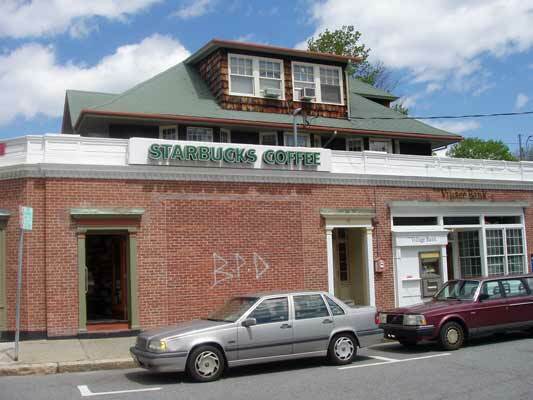 Although significantly altered, the shingle style structure remains an important component of Waban’s commercial center. If you look carefully you can see the three windows under the roofline which are part of the original structure seen in the black & white photo above. 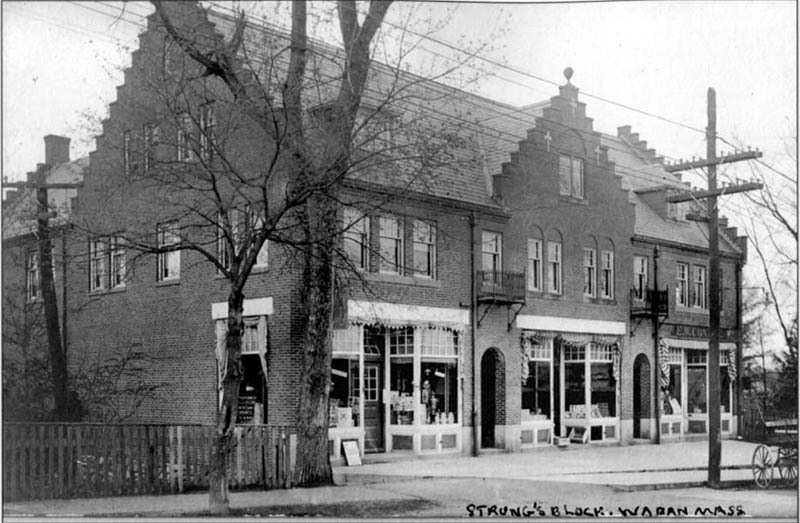 In the delightful and nostalgic “Waban‑Early Days” the village is described as “a sleepy little town by the curve of the shining river” ….”a village full of peace” with “the houses far apart and the fields white with daisies ‑‑ this in 1905. In fact it did not even begin to change from a few large farmsteads into a growing community until the coming of the railroad in 1886. But lets go back a couple of centuries when Algonquin Indians of the Nipmuc or Nipnet tribes roamed the area within the bend of the Quinobequin River (now the Charles). This was a favorite hunting ground of Waban chief of the Nonantum tribe who had huts hereabouts. The village was named for Chief Waban in 1886. From the winding Charles on the south stretched an upland plateau surrounded by swamps and meadows, and broken by the watershed s of Cheesecake. Dresser and Cold Spring Brooks, good trout streams in earlier days. A puddingstone ledge stretched along Chestnut Street. In pre‑Waban” days, four large farmsteads met at the Junction of the present Woodward and Beacon Streets, with a highway known as Sherburn Road running east and west. Virginal stands of white pine and noble oaks lined the roadways. Several small ponds, most of which have since been filled in, provided skating, wading, boating and turtle hunting. A deer park near the present Brae Burn Country Club was a favorite spot for picnics and for gathering chestnuts. The aqueduct through the area was built in 1848 to carry water from Lake Cochituate in Wayland to Boston. For years the City Poor Farm stood opposite the Collins Farm on Sherburn Road, and Pine Farm, a School for Wayward Boys, was at the corner of Chestnut and Fuller Streets. Successful market gardens were carried on in Waban for many years. In 1902 “our peaceful little village was on the very brink of ruin” when it was threatened by the invasion of a trolley line, but this disaster was prevented. “The Church of the Good Shepherd” (Episcopal) was built in 1896. Union Church, unique in that from the beginning it provided a church home for Protestants of any denomination, was dedicated in 1912. The Catholic Church of St. Philip Neri was built in 1928. 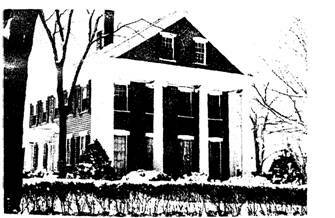 11 Anita Circle ‑ Built in 1809 or earlier. 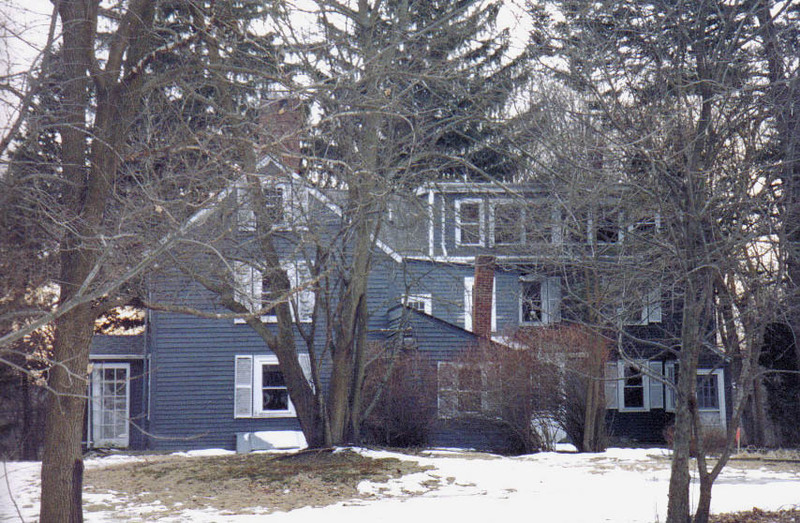 This house was originally located on Richardson Road, Newton Upper Falls, and is one of four small dwellings built by Mr. Ellis, all similar in architecture. Way back in 1688 Deacon John Staples, a weaver and Newton’s first schoolmaster, built a small house on this site. He and his wife had no children of their own but raised several boys including Moses Craft, a relative of Mrs. Staples. When the Deacon died, Mr. Craft inherited the property with the stipulation that Mrs. Staples be allowed to make her home there during her lifetime. Along about 1750 in keeping with his new status as “gentleman” and representative to the General Court of the colony, Mr. 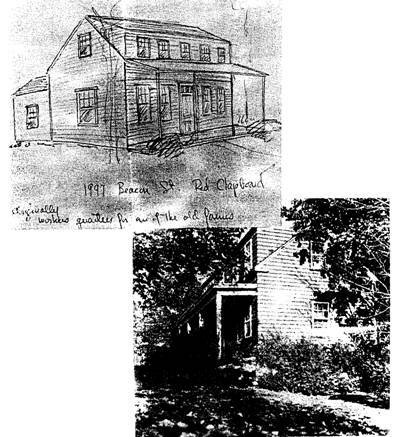 Craft built here a colonial farmhouse two and one‑half stories high with five windows and two rooms across, and one room wide, with two chimneys running up the back, each serving two rooms. 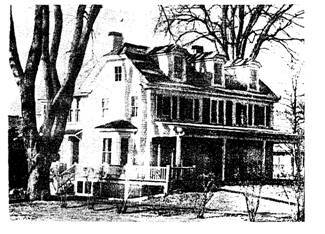 In 1768 he rebuilt the kitchen ell “the original Staples property) to provide more room for his growing family. David Kinmonth, a Boston merchant, bought the house in 1858 and rebuilt it, giving Victorian overtones to the basic Georgian style still evident in the white Garbed woodwork. The most authentic Federal room in the house is a large, oval dining‑room. For a number of years the house served as rectory for the Church of the Good Shepherd. This is the Staples house, known to us in the Fifties as the Ellis House, in which resided Rev. Ellis of the Church of the Good Shepherd. The house was re-built in the Civil War, but apparently the ground plan and foundation go back to the 1680s, and it is said that Rev. John Eliot married one of Staples’ daughters here. – James Mitchell The Farmhouse was purchased by the Suzuki Music School in 2018. City Landmark Report. 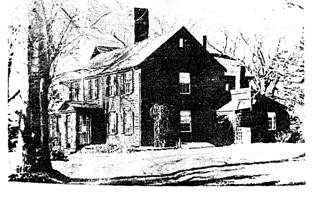 The Collins family was one of the first to settle in the Waban area, Matthias buying land here in 1731. Various members of the family built homes along Beacon Street, but the only one surviving is this fine example of the Greek revival period. It was the home of Frederick A. Collins, a member of the City Council and operator, along with his brother, Edward, of a local glue factory. His wife was a grandniece of Paul Revere. In 1895 the Edward J. Collins house down the road was remodeled as a private school for boys. 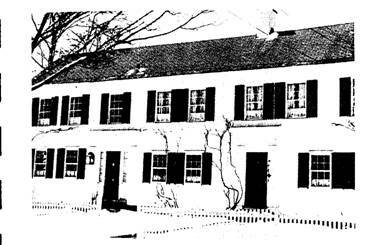 This house at 1734 provided dormitory space for fifteen boys and assistant teachers and was called Eliot Hall. At that time it was surrounded by beautiful maple trees and had a tennis court on the west side. 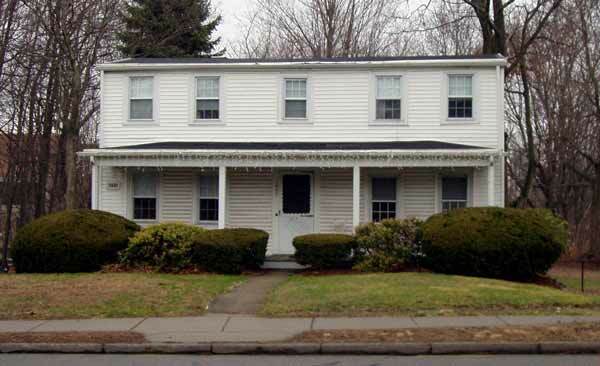 Here is one of Newton’s most outstanding Greek revival dwellings. There are twin black marble fireplaces in the living room. 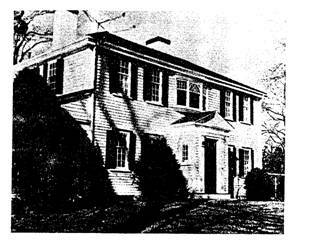 In 1857 Mr. W. B. Locke who made the long trek to California as a 49er returned to Waban and purchased this property where for half a century he conducted a market harden business. One of his daughters tells of the horse being struck by lightning which stunned the children of the family and killed a St. Bernard dog. In 1810 a Poor Farm was built on adjoining land and extensive farming was carried on here as well. Eventually Brae Burn Country Club acquired some of the Locke acres, and other portions became quiet, pleasant suburban streets. This is one of the former workmen’s quarters, attached to some farm of the area. A side ell was added at some later date. The old shed at the rear has red clapboards and a door with verti­cal boards and three square lights across the top. 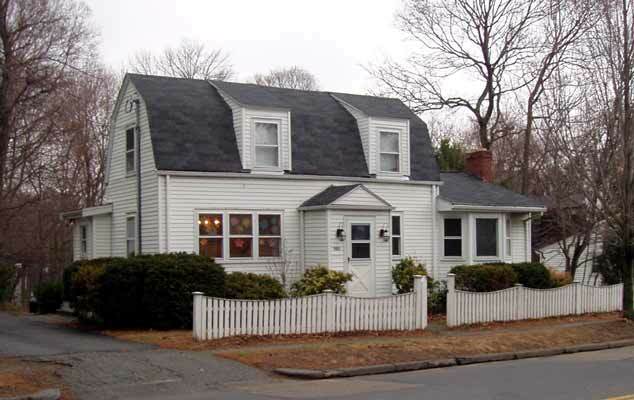 1997 Beacon Street ‑ Built before 1800. Probably another of the workers’ quarters attached to one of the nearby farms. The house originally had four rooms, two down, and two upstairs which had slanting ceilings. There was no kitchen since the worker would have eaten his meals in the main house, so the present kitchen dates from much later. The house has steep narrow stairs, random width floor boards, and the type of window which has to be propped open. The original plaster contained horse‑hair and served as excellent insulation. The fine old home known as “The Woodward House” is without much question the second oldest house in Newton and taxi boast of having housed eight generations of a single family. It was a worthy setting for a long line of fine and useful citizens. 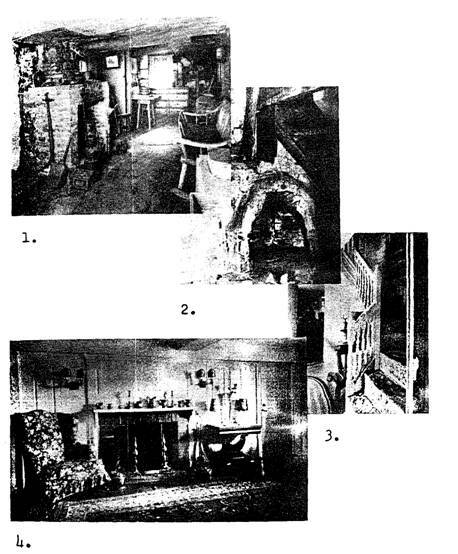 Originally the homestead was a two and one‑half story structure consisting of two front rooms, two rooms above, and the kitchen. A ladder to the second floor was drawn up at night. Brick and mortar gave added protection to the timbers, surely from the cold and perhaps from the Indians (although Newton Indians appear to have been friendly). Handhewn boards seventeen inches in width were laid for the flooring, and the handshaved clapboards were secured with handmade nails. The massive chimneys and Dutch‑tiled fireplaces remain as originally constructed. A secret niche behind one of the stairways was used to hide ammunition and arms during the Revolution. Beginning in 1729 various additions were made. Under six layers of wallpaper was discovered pine paneling twenty and one‑half inches in width. On the doors are butterfly and H and L hinges. Old kitchen with mares original furnishings. Secret niche behind one of three stairways in the house. Used to hide arms and ammunition during the Revolutionary War. Front stair hall showing unusual painted steps and risers. Parlor, ‑ note the paneling and hardware. 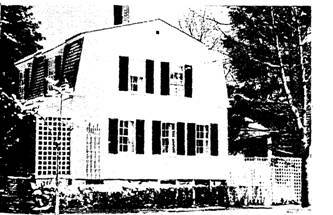 This house formerly stood at the corner of Chest­nut and Fuller Street and was known as the Raymond‑Cotter house. Harriet Beecher Stowe used to visit here. This is undoubtedly another of the workmen’s cottages for one of the farms in the area. While various improvements have been made over the years, certain aspects of its interior, particularly the stairway, show its real age. The general style is like that of 1997 Beacon Street, but the addition of the kit­chen ell gives it the appearance of a saltbox. 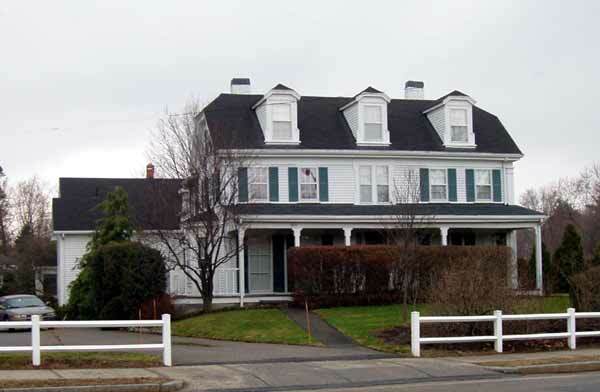 This picturesque farmhouse, now one‑half of the original size, formerly faced on Boylston Street. It was turned around when the over‑pass was built in the 1930’s. It is usually referred to as the Dresser Farm from Robert W. Dresser who purchased it in 1872 and brought up eight children there. One of his daughters tells of her recollections of candy pulls in the kitchen on cold winter nights, following skating on the nearby pond. Numbers of young people would gather to pull great ropes of molasses candy over large hooks in the walls. In 1896 this house was moved to this location from Homer street by Mr. Cotter. The house is probably thinner from front to back than it was originally. At some point this house was converted from a barn into a dwelling. A small square window located dust under the roof edge is typical of early barn construction. 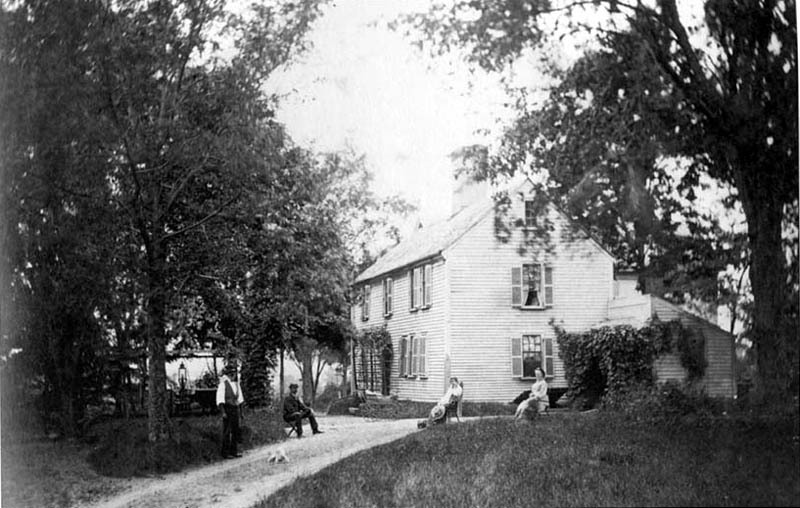 15 Winnetaska Road ‑ Built in 1736. 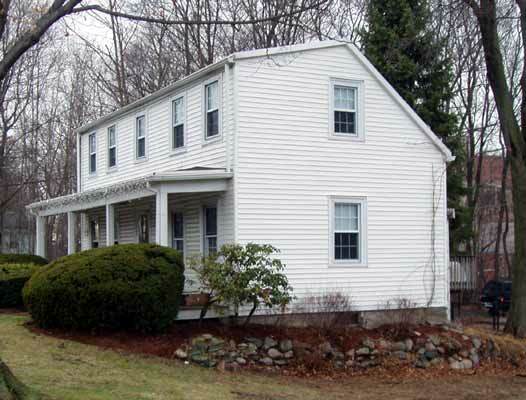 The original portion of this house stood on the present Metacomet Road and was one room deep. The owner at that time was Eben Bartlett. Andrew Wyman, Jr. bought the house for $1,000 in 1894 and moved it to its present location. The saltbox addition was made at this time. The two front doors are an interesting feature. An authentic 1750 wallpaper was discovered under many layers and the pattern has been reproduced for sale. 401 Woodward Street ‑ Probably built between 1720 and 1730. This house was built by Eleazer Hide (later spelled Hyde) Jr., a weaver and the eleventh of twenty‑one children. It was originally a simple farmhouse of a common colonial design, two stories high, two rooms on each floor separated by a center hall, and with five windows across the front. The rooms were heated by fireplaces from two chimneys running up the back of the house. There was a kitchen ell to the rear. In 1844 the farm was bought by Thaddeus Tower. He was soon beset by the problem of having his barns cut off from his pastures because of land‑taking for the construction of an aqueduct running from Lake Cochituate to Boston, but a solution was finally worked out. 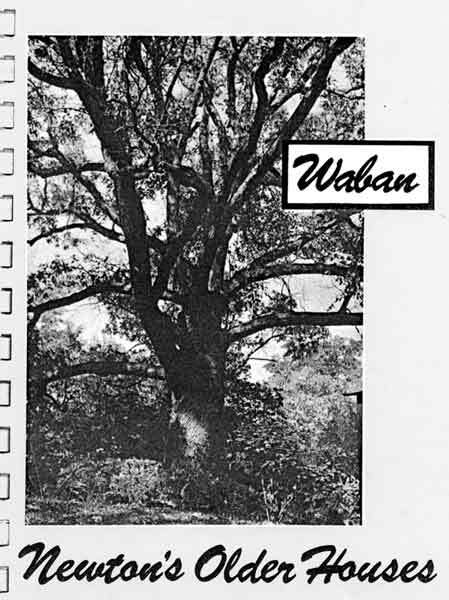 In 1866 T. Tower sold the property to Colonel Edward Wyman who planted black and white mulberry trees in an attempt to introduce silkworms to Waban. The project was not successful, but generations of birds have enjoyed the berries ever since. With the coming of the railroad in 1886 much of the Hyde farmland was divided into house lots. In 1887 the house itself was sold to Catherine B. Reed. Shortly afterward she married H. Langford Warren, Dean of the Faculty of Architecture at Harvard, who remodeled and enlarged it to its present appearance with a large wing at the back which nearly doubled its size. Thus the unprepossing farmhouse took on the characteristics of an imposing suburban home.